Completely renovated, this modern three bedroom apartment in the dynamic resort of Plagne Bellecôte can accommodate 7 people comfortably: two in the master double bedroom, two in a second double bedroom with sofa bed, and three in a bedroom with bunk beds . Possibly an eighth bed is possible on the couch of the living room. The two double rooms each have a flat-screen TV, and the three bedrooms have ample storage space. Linen (bed linen and towels) can be provided to order from our concierge, in addition to the rent. The living / dining room is spacious, has its own flat screen TV, and its west facing balcony offers great views of the Alps. The kitchen is equipped with a large fridge / freezer, ceramic hob, microwave / grill, Senseo coffee maker, kettle and full cookware. The shower room is completely new, with two showers, and a heated towel rail. The toilets are separate. 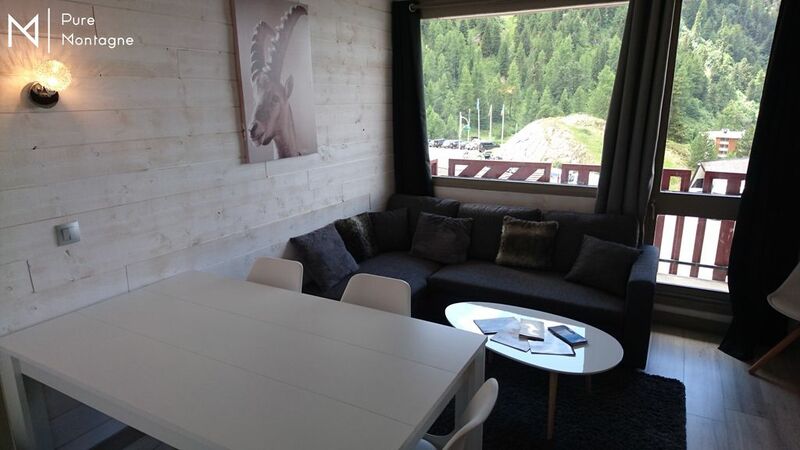 The apartment also has a private ski locker, and we offer you free access to the resort's pool, heated all year round. The resort also has a lot of car parks available within 200m of the apartment, including covered parking in winter and free in summer. We had 4 adults and 2 children for our stay over new year. The apartment is well located for the shops and lifts. It is as described and the pictures are accurate. The kitchen is well equipped with many pans of different sizes. Good sized mugs and decent wine glasses were provided which is unusual for French apartments in my experience. Free use of the swimming pool is great, especially for the kids. Good communications with the owner. I would stay again. L'appartement est confortable, fonctionnel et rénové avec goût. Le système de conciergerie permet un départ tôt dans la matinée. La situation dans plagne bellecote est idéal proche du départ des pistes et des commerces. Je vous recommande ce logement. Appartement très bien aménagé et refait à neuf. Vacances passées à 6 dedans sans problème. Localisation idéale pour passer des vacances d’été avec des enfants en bas âges car de nombreuses animations et activités sont à disposition. Cadres et paysages et magnifiques et de très belles balades à faire dans les environs. A refaire !! Un très bon appartement bien situé, refait a neuf. Très bel appartement!! Refait à neuf!! Résidence très calme. Nous reviendrons sûrement. The six mountain resorts of La Plagne, between 1800 and 2100m, offer a multitude of activities that will appeal to the greatest number. Our apartment Pure Montagne is located in Plagne Bellecôte (1930m), active and dynamic station, and starting point for the glacier. The Domaine de La Plagne has 225km of pistes for all levels, with adapted packages so that everyone can benefit from their experience. In addition, since 2003, La Plagne is part of Paradiski, the second largest connected ski area in the world, joining Les Arcs and Peisey-Vallandry with 435km of pistes. Paradiski offers stunning scenery with views of Mont Blanc and a 360 ° panorama of the French Alps, quality skiing at all times with varied slope exhibitions, a domain accessible to all levels, and ski lifts and a network of snow of culture among the most modern. La Plagne also offers many activities for non-skiers, such as bobsleigh, ice climbing, snowshoeing, dog sledding, etc. And for those who never have enough, the outdoor pool heated to 29 ° (at the foot of our apartment, access offered to Pure Montagne tenants) and the ice rink are also on the program. Finally Plagne Bellecôte ensures a festive and lively atmosphere in après-ski, so that your holidays are truly unforgettable! In the summer, Plagne Bellecôte welcomes you close to the activities of altitude for dynamic stays and sportives out of the commun run. You can enjoy hiking, mountain biking, paragliding, via ferrata, horseback riding, archery, etc. in the heart of a preserved nature. Plagne Bellecôte is directly connected to Belle Plagne and its numerous restaurants by free cable cars at extended times (around 9 am-midnight), and to the other mountain resorts of the domain by a free shuttle service, giving you easy access to multiple atmospheres for a successful holiday! Whether you want to relax, unwind or escape, La Plagne will offer you an unbeatable choice of unforgettable activities for the whole family. La location des draps de lit et du linge de maison (incluant serviettes de toilette) est possible en supplément, contactez-nous pour les tarifs. Un service de ménage de fin de séjour est possible en supplément, contactez-nous pour les tarifs.